Meat has been getting quite the bad rap lately- pink slime, mad cow, e.coli and now meat glue! It’s enough to make a person crazy just thinking about it all. I will admit, I LOVE meat: beef, pork and chicken. I try to eat meat at least once per day but it seems that should stop. But why? What’s so wrong with meat. For starters, it has recently been proven that the quickest way for us to achieve timely, disaster-averting climate change is by eating less meat. Secondly, it can do your body and health wonders by eating 15% less meat per week. – LIMIT CANCER RISK: Hundreds of studies suggest that diets high in fruits and vegetables may reduce cancer risk. Both red and processed meat consumption are associated with colon cancer. – FIGHT DIABETES: Research suggests that higher consumption of red and processed meat increase the risk of type 2 diabetes. – CURB OBESITY: People on low-meat or vegetarian diets have significantly lower body weights and body mass indices. A recent study from Imperial College London also found that reducing overall meat consumption can prevent long-term weight gain. – LIVE LONGER: Red and processed meat consumption is associated with increases in total mortality, cancer mortality and cardiovascular disease mortality. – IMPROVE YOUR DIET. Consuming beans or peas results in higher intakes of fiber, protein, folate, zinc, iron and magnesium with lower intakes of saturated fat and total fat. – REDUCE YOUR CARBON FOOTPRINT. The United Nations’ Food and Agriculture Organization estimates the meat industry generates nearly one-fifth of the man-made greenhouse gas emissions that are accelerating climate change worldwide . . . far more than transportation. And annual worldwide demand for meat continues to grow. Reining in meat consumption once a week can help slow this trend. – MINIMIZE WATER USAGE. The water needs of livestock are tremendous, far above those of vegetables or grains. An estimated 1,800 to 2,500 gallons of water go into a single pound of beef. Soy tofu produced in California requires 220 gallons of water per pound. – HELP REDUCE FOSSIL FUEL DEPENDENCE. On average, about 40 calories of fossil fuel energy go into every calorie of feed lot beef in the U.S. Compare this to the 2.2 calories of fossil fuel energy needed to produce one calorie of plant-based protein. Moderating meat consumption is a great way to cut fossil fuel demand. And if that isn’t enough, then just think about how hard it is to get good meat and quite frankly how much you will save on your food bill! If you are interested in learning more about the non-profit organization Meatless Monday, check out their website and all of the celebrities and chefs supporting the cause. 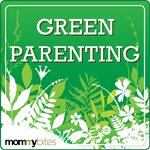 Green Parenting is published every Friday. For questions or to suggest a topic, email [email protected].